Blythe dolls get customised quite a lot - and there are people who are very skillful at it, making quite beautiful dolls that sell for quite a lot of money. 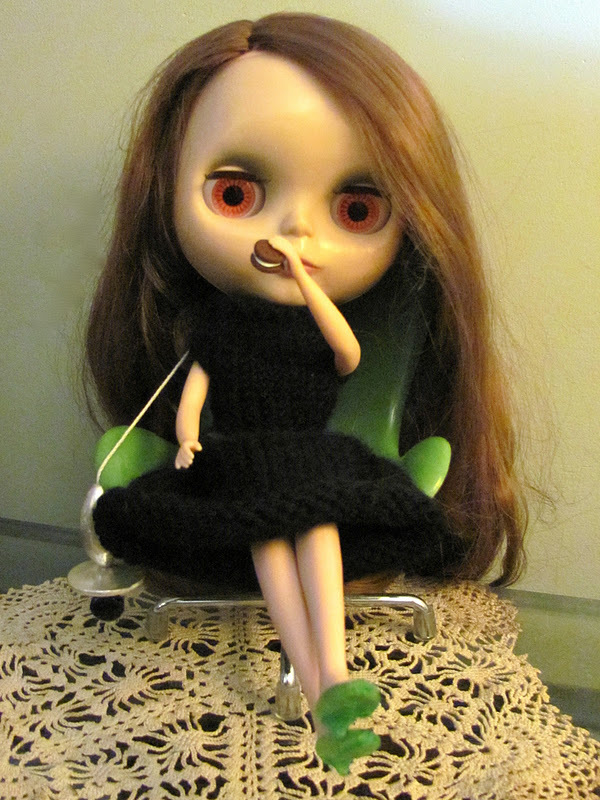 I'm not one of those people - I'm very timid about the whole idea of tampering with a doll; especially a doll I'm very fond of - I might wreck her!! But Lillian had a neck problem and her head was getting quite wobbly. She'd fallen off the desk where she lives a couple of times and when we were in France, she fell off a statue. Little chips had come off her head where it meets the neck. Ashton Drake Galleries (ADG) made Blythes from 2004 to 2007 - replicas of the original Kenners and slightly cheaper than the Takara dolls. 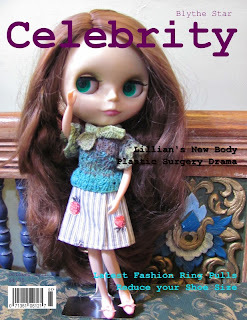 Blythopia gives a listing of all the different Blythe Dolls. Well, back to Lillian's neck problem - to fix it I knew I would have to open her head which got me thinking about giving Lillian a whole new body. 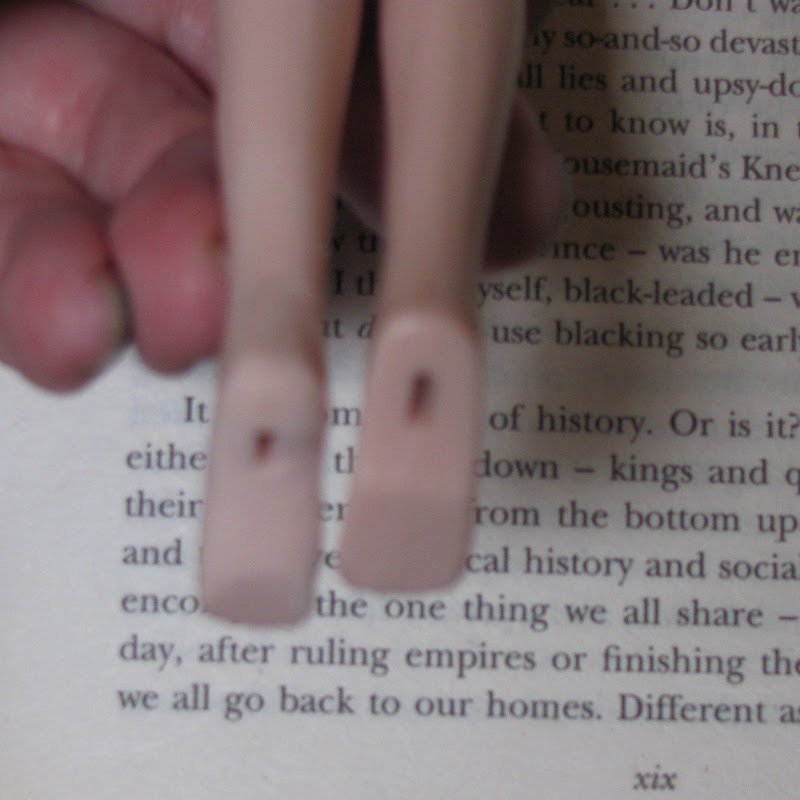 ADG dolls don't have bending limbs whereas most Takaras have 3click bending legs, I'd also seen customised dolls with extremely flexible bodies (ball jointed). 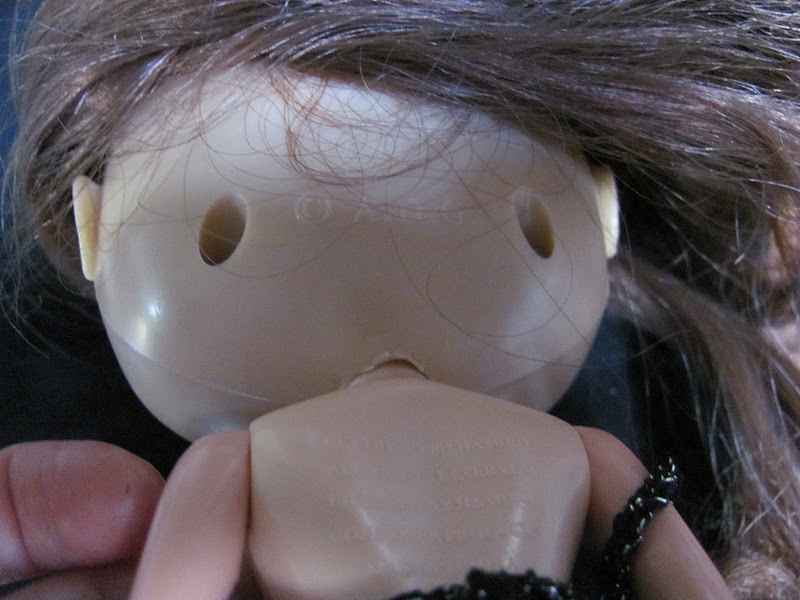 All quite tempting and very confusing so I consulted the folks on the We Play with Dolls Forum - had a couple of recommendations for the Licca body - and found out that those wonderful ball jointed bodies have problems supporting the (rather enormous) weight of a Blythe head. 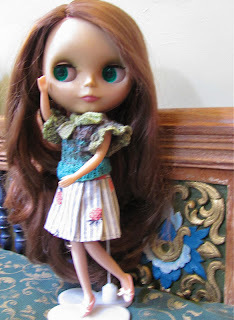 Licca is another doll made by Takara - they have a similar body to Blythe but a more normal sized head. 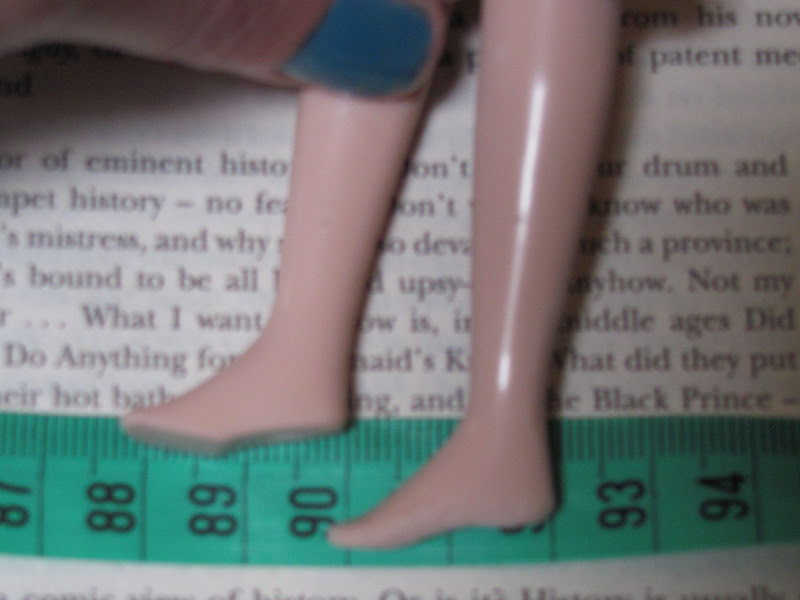 So I bought a Licca doll and took her head off (cackles in evil-witch fashion)!!! 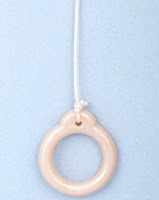 The legs bend without clicks and the arms are very flexible. So I started on the feet - carving with the blades of some sharp little scissors, then sandpapering, then using very fine glass-paper (240) for smoothing off. It took ages (partly because I really didn't know what I was doing and was quite timid) but I managed to achieve a much nicer and smaller foot. The Licca foot was rather unformed but there were slight indentations for the toes which I wanted to keep and I managed to narrow the foot without losing any! Only needed to reduce the width a little. 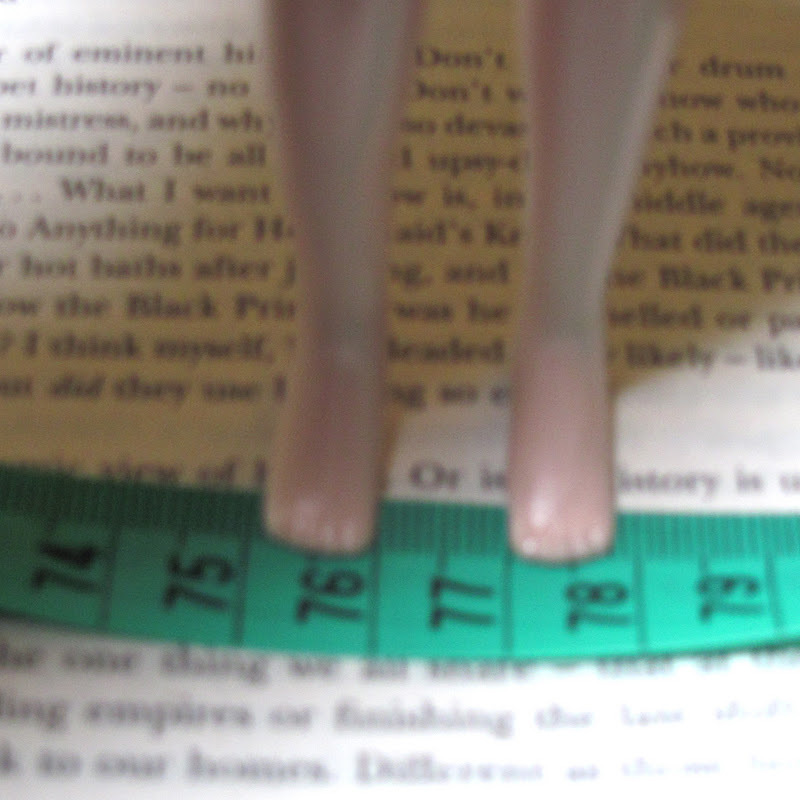 I shortened the foot at the heel and made it nicely rounded. I carved an instep - and I think this really makes the foot look more 'real'. Also thinned the ankle a little and sandpapered the moulding 'seams' on the leg. After checking that even the smallest of the Blythe dolls' shoes fitted that new foot I had to work on the second one and make it match! 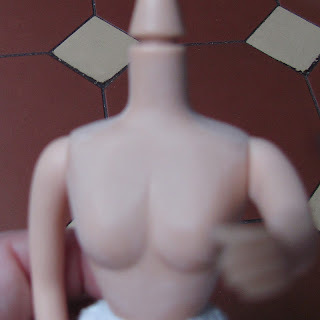 Once the Licca had Cinderella feet I took the sandpaper to the torso - lowering that cleavage, reducing the chest under the arms, reducing the 'step' / bump where the shoulder meets the arm and taking off 'seams'. 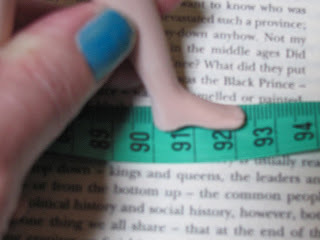 Having perfected the new Licca body it was time to address the problem that started me on this whole process! 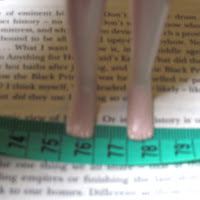 And Lillian's wobbly neck problem was not due to the body - it was actually in her head (oh dear!) How to fix those chipped bits?? As Lillian is an ADG, to get inside her head (oh dear again!) to open her head fully, I would have to scalp her first ... remove the whole of the top of her head. Far too too scary. 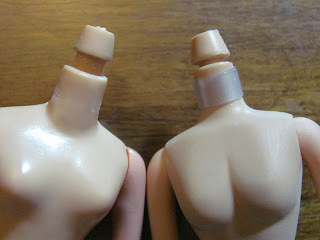 If I couldn't get into the head and somehow mend those chipped off parts, perhaps I could pad-out the new neck. 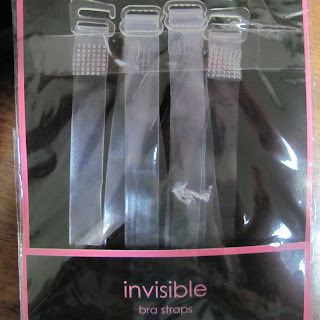 Those things are certainly NOT invisible when used for the intended purpose - my daughter calls them "sticky tapes". However, they were just what I needed for Lillian. Cut enough to go round the neck 1.5 times and (after testing) I used a tiny amount of 450 glue to keep it in place. I studied the only YouTube I could find and it seemed really easy to switch bodies - it wasn't. The head screws were very tight - hubby darling came to my rescue there and the old body came out OK but the new one didn't go in with ease. If you scroll back up to the beheading photo you'll see the Licca neck knob thing is quite long and conical with a narrow groove between it and the neck part - in this photo Lillian's old ADG body is on the left - that knob thing is short and the groove is wide. The Licca body is on the right with bra strap padding in place and I've started work on the knob - chopped it with a hack-saw blade then sanded it down. And sanded it a bit more. Then I took to the groove with that hack-saw blade until it was wide enough that it fitted and we could close up the head. Actually there is still a small gap - I should get back in there and hacksaw a little bit more! Maybe later - I found the whole body switch operation rather traumatic! Meanwhile, Lillian (and myself) have recovered from the surgery and we are very happy with the new bending limbs and steady head. Audrey has been a really good friend, she helped nurse Lillian through her convalescence and then took her out dancing to celebrate her New Body. Oh - almost forgot! 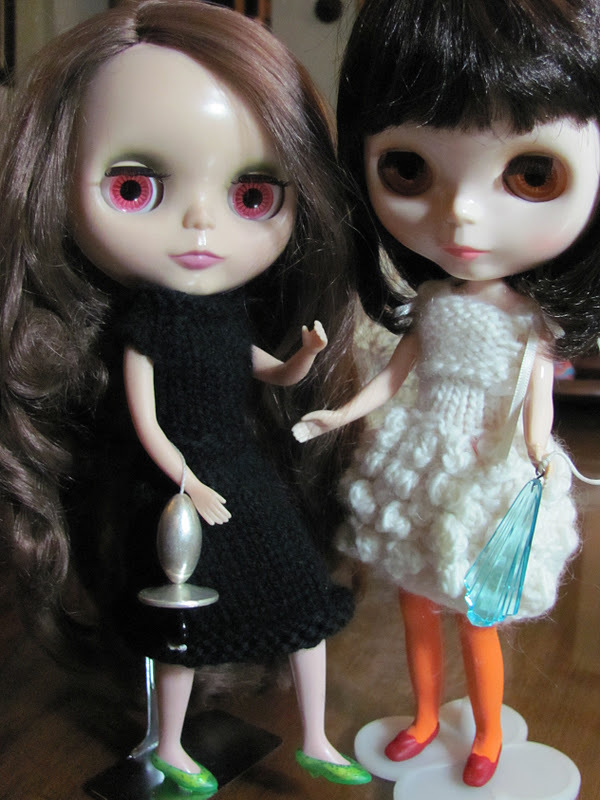 Both girls also have new 'ring pulls'. The Blythe doll ring pull is a bit iconic - but I'm not fond of it and thought I'd give my dollies things that expressed their personalities a bit better. I love the "Celebrity" magazine cover image!